Wild horses • Emergency action in offing as critics weigh in on public lands conflict. 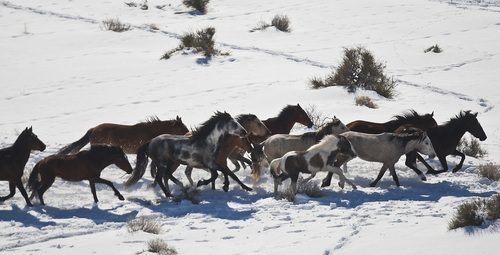 Chris Detrick | The Salt Lake Tribune Wild horses are rounded up near the Swasey Mountains in Utah on Feb. 14, 2013. Of the 257 horses gathered, nearly 100 ó many of them mares treated with a contraceptive ó were returned to the range. Others were adopted or held in captivity. The federal Bureau of Land Management is charged with managing the estimated 36,000 wild horses roaming 10 Western states. Iron County Commission chair Dave Miller said Monday afternoon that at least a partial roundup of the horses could happen this week. "What we hope to have in place is the fine details to be able to do it this week," Miller said after meetings throughout Monday. "We won&apos;t be able to do everything all at once. We will focus on utilizing the resources we have available and get the processing going." "We urge the Utah officials  who have no jurisdiction in this matter  to refrain from removing wild horses from BLM lands in violation of federal law," reads the letter. "We also urge the Utah and Nevada BLM offices to adhere to the federal laws, policies and procedures that are in place to protect wild horses." County officials complain the horses are wreaking havoc on range shared by native wildlife and by cattle that are allowed on BLM land under grazing permits. The Utah office of the BLM has estimated 1,200 horses are spread over several management units. The agency&apos;s own plans call for 300. Trib Talk: What to do with wild horses?